Home surveillance is a top priority, but can be challenging when you need a covert device that isn't limited by battery life. 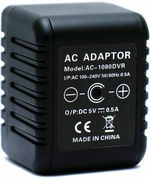 With the new Hidden Camera Power Plug you won't have to settle anymore! Plug in. Since it plugs into the wall you won't have to worry about the tradeoff between covertness and battery life; as long as the camera is plugged into the wall it will be powered. This model looks just like a standard power plug and will blend in with any room in the house. High quality recording. You can record 1920*1080 resolution video, using MicroSD cards up to 128GB. 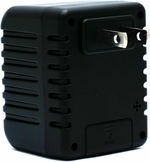 This hidden camera uses motion-activation recording which will also help save on storage space. The device will only record 60 seconds at a time when it senses motion. Angled camera. The camera is actually angled 15º upwards so it can follow the movements of anyone who walks through the room, even if the outlets are low to the ground. So next time you are going to be away from home rest easy knowing that the Hidden Camera Power Plug Plus is keeping an eye on your things.